What Can You Do with Medeek Foundation? Welcome to the documentation for the Medeek Foundation extension. 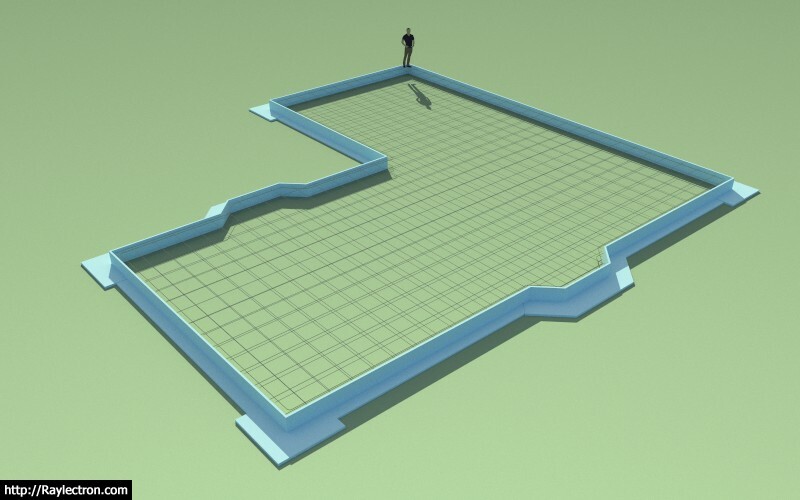 Medeek Foundation is a SketchUp Extension that provides a simple interface for creating accurate 3D foundation and footing geometry within SketchUp. This extension utilizes the SketchUp Ruby API programming interface and is compatible with the latest SketchUp releases (SketchUp Make 2017 64-bit and SketchUp Pro 2019 64-bit) as well as previous versions (2015, 2016, 2017, 2018). All foundation types are drawn/designed utilizing industry standard practices. Additional foundation types and footings are in the process of being added. Custom layers can be enabled in the global settings which allow concrete, rebar, insulation and wood framing to be placed on specific layers. Rebar or mesh, foundation vents and anchor bolts are optional elements. Perimeter insulation for FPSF is available for rectangular or polygon slab-on-grade and stemwall foundations. The extension allows the user to create either an rectangular or irregular (polygon) shaped foundation plan. When the rectangular foundation is selected the outline is defined by simply selecting three points which form the bounding rectangle (bldg. width x bldg. length) of the foundation. 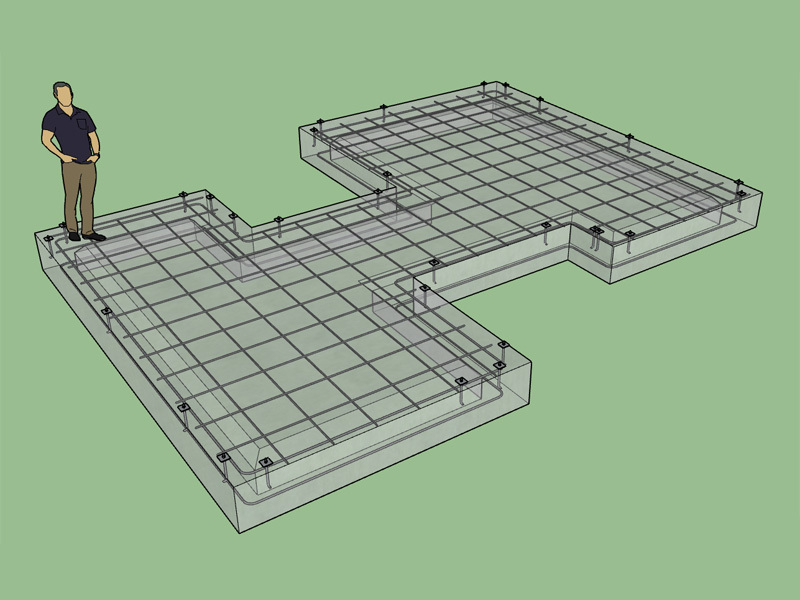 With the Medeek Foundation extension, you can accurately depict typical concrete foundations, footings and flatwork within SketchUp and better validate your architectural models. The Medeek Foundation extension is in the process of being integrated with the Medeek Footing Calculator and will be able to provide engineering data for specific common footing types. For additional engineering tools and site criteria maps please visit our Resources page. This document is intended for architects, engineers, designers and homeowners who are using SketchUp as their primary 3D design tool. It provides an introduction to using the extension and reference material on the available parameters/options for its use. The Medeek Foundation extension is a proprietary softare developed for use with the SketchUp 3D modeling program. There are currently no limits to its use for both personal and commercial applications. The trial version of the extension has all the features of the full extension however the width and length of the foundation or footing may be limited to a specific range of values. The trial version is also time limited to a thirty day period from the date of installation. Once the trial period has expired you will no longer be able to create new foundations however you can edit any existing foundations and features. The full version is an unrestricted, permanent license for both commercial and personal use. Installation on up to (3) separate machines per licensed copy is allowed. Free upgrades to the latest version of the extension can be downloaded at any time, within one year of purchase, by logging into the Account Manager. Once the first year has expired the license can be renewed ($10.00) on a yearly basis. Please note, an active license is not required to continue to use the extension. The extension will continue to function even if the license expires. The only reason to renew your license is to gain access to recent upgrades to the extension and also enable unlimited phone and email support. Please do not redistribute unlicensed copies of the extension. Download of the extension is available immediately after purchase. Please login to the Account Manager to download the most up-to-date version of the extension. For professors, teachers and students requesting a fully licensed copy of the extension for educational use, please send your request via email to support@medeek.com. The mdkBIM suite combines all three extensions (Wall, Truss and Foundation) into one convenient package that can be purchased at a fairly sizable discount. The mdkBIM suite includes the full version of the wall plugin and will also include any future add-on plugins or modules. Free upgrades to the latest versions of all three extensions can be downloaded at any time, within two years of the initial purchase date, by logging into the Account Manager. Once the initial two year license period has expired the licenses for each extension are renewed separately at the current renewal price. Click on the Open button. SketchUp will install the extension and display a security prompt. The extension will display a prompt for your extension serial number (default value is "TRIAL") if this is a new installation. The Medeek Foundation extension will now appear in the list of available extensions. Re-start SketchUp to enable the license and serial number and save the settings to the registry or .plist files on Mac. Within SketchUp select Window > Extension Manager (Microsoft Windows) or SketchUp > Extension Manager (Mac OS X). The Extension Manager dialog box is displayed. If you are a registered user you can obtain the latest version of the extension, at no additional charge, by logging in to the Account Manager. Click on the extension icon and then on your order number, if your order was placed within the last year then you will see a download button which will allow you to obtain the latest version. If a year has expired since you purchased a license then a upgrade button will appear which will allow you to renew your license at a reduced rate for another year. Once you have downloaded the new release, completely uninstall the existing extension prior to installing the latest release. Failure to completely remove the existing extension may cause some files to revert to the older version and limit the functionality of the extension. Note, some menus may show additional items that are either under construction or planned for future releases. Sample SketchUp models related to these tutorials files can be downloaded here. View the Medeek Foundation Manual for detailed information on the extension and its usage. The current version of Medeek Foundation is 1.2.3 - revision date: 03.15.2019. View the Medeek Foundation Changlog for more information on updates to this extension. The extension will automatically check for an updated version once a month. The frequency of the "check for updates" can be set in the global settings or disabled entirely. For a more in depth look at the development of the extension and related discussions please visit the Medeek Forum. WARNING: The Medeek Foundation extension is currently under development. The user may encounter unintended behavior due to the addition of new features on a daily basis. Always backup your data to separate file names to provide redundancy in case of file corruption or other data loss scenarios. If you have any questions or concerns about the Medeek Foundation extension please call us at 1-425-652-4188. These sponsors provide an ongoing role in the development of the extensions and whose valuable suggestions often find their way into the various tools and features found within each extension/plugin. A Certified Professional Designer with the American Institute of Building Design, Larry Belk has been active in the home building and design industry for over 30 years. In 1995, he was inducted into the College of Fellows of the AIBD the highest obtainable award of the Institute. Larry’s plans appear in many national publications and are built in 50 states and 15 foreign countries. He is the recipient of several national design awards and a member of the National Home Builders Association. He is also a licensed Building Contractor and Interior Designer. These sponsors have commited to providing a minimum $300.00 annual sponsorship to assist in the further development of the mdkBIM extension suite. Contact us to have your company listed here. These sponsors have commited to providing a minimum $200.00 annual sponsorship to assist in the further development of the mdkBIM extension suite. These sponsors have commited to providing a minimum $100.00 annual sponsorship to assist in the further development of the mdkBIM extension suite.